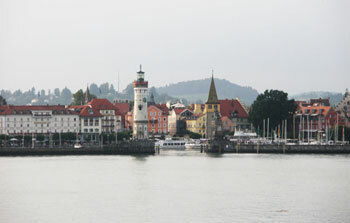 A select number of graduate students will have the unique and exciting opportunity to meet and learn from dozens of Nobel Prize winners next summer in Germany during the annual Lindau Nobel Laureate Meeting. Now’s your chance to nominate your most outstanding students. If you are unacquainted with this program, you can visit the official Web site or watch a video about the 2009 meeting . The 2010 meeting will feature Nobel laureates from chemistry, physics and physiology/medicine. Photo taken by NIGMS-supported 2009 meeting attendee Erika Milczek, a graduate student at Emory University. Last year, NIGMS was a sponsor of the meeting, and we are pleased to be one again in 2010. As I described in an earlier Feedback Loop post, the 2009 meeting gave students the opportunity to meet 23 chemistry laureates. The nomination and selection process will be exceptionally competitive, as the scientific coverage will be much broader than last year. Each university may nominate only one student per sponsoring agency (NIGMS, NSF and DOE). Keep in mind that nominees for NIGMS sponsorship must be involved in projects supported by NIGMS or supported by an NIGMS training award. Additional information about the meeting, including student eligibility and the nomination procedure, may be found at this Web site . Nominations are due by October 30 and should be submitted directly to the Lindau organization using an electronic submission form. Please contact the organizer of the U.S. delegation, Sam Held, with questions about the 2010 event or nomination procedures. You may also e-mail me or Mike Rogers at NIGMS, especially with questions about eligibility for NIGMS support. We’re once again soliciting applications for exceptionally innovative research projects whose outcome, if successful, could have a major impact on a broad swath of the scientific community. NIGMS is the lead institute for the EUREKA initiative, and eight other NIH institutes are also participating this year. If you’ve got an idea that could change the world, and your research interests mesh with those of any of the participating institutes, you should consider applying for a EUREKA grant. In general, we’re looking for projects that can be started and completed during the term of the award. The exceptionally innovative component can be the hypothesis that you’re testing—a novel, unconventional idea that challenges prevailing wisdom—or a clever solution to a technological or conceptual problem that’s impeding progress in your field. Interested? Check out the funding opportunity announcement in the NIH Guide. You can apply for up to $250,000 (direct costs) per year for a maximum of four years. NIGMS has set aside $6 million for EUREKA awards in fiscal year 2010. When you look at the application instructions, you’ll see that EUREKA applications are very different from conventional R01s. In your biosketch, you’ll be citing up to 10 publications, patents and meeting abstracts that demonstrate your ability to use innovative approaches to challenge conventional wisdom or solve difficult problems, rather than simply listing your most recent publications. In the research plan, which is only seven pages long, you’ll be answering questions that are designed to focus your attention on the importance of the problem, the novelty of your hypothesis or approach and the magnitude of the potential impact, rather than on experimental details. It’s not as formidable as it sounds. Many of the investigators who applied for EUREKAs in past years have told me that they enjoyed writing their applications—not a comment that we hear very often from the scientific community! The receipt deadline for EUREKA applications is November 24, 2009. This is a special receipt date, so you won’t be able to get an extension for personal reasons or study section service. We’ll be reviewing applications in March or April 2010, and plan to make awards (around 20) in the summer of 2010. For more information about EUREKA, check out our Frequently Asked Questions (Link no longer active). At the recent meeting of the National Advisory General Medical Sciences Council, our Council members had their first opportunity to examine summary statements using the new peer review scoring system. Many aspects of the new scoring system are unfamiliar, including the use of overall impact scores as integers from 10 (best) to 90 (worst). A summary of the new scoring system is well described in a scoring system and procedure document, and an earlier version of this was shared widely with reviewers. As background, I compiled some data for approximately 300 NIGMS R01 applications reviewed under the new system. This plot shows the distribution of overall impact scores along with the corresponding percentiles. Note the relative spread of percentile scores at a given impact score. This spread is due to the fact that percentiles are determined independently for each study section that considered 25 or more R01 applications. Otherwise, percentiles are determined across the overall pool of R01 applications reviewed by the Center for Scientific Review. For comparison, here is a plot of a similar number of NIGMS R01 applications reviewed using the old scoring system. Note the similar spread of percentiles at a given score due to study section-specific percentiling. I would like to mention another major change as a result of the NIH Enhancing Peer Review effort. You must use restructured application forms and instructions, including a 12-page length limit for R01s, for applications due on or after January 25, 2010. For details, see the recent NIH Guide notice. We plan to post updates about these changes as key dates approach. Three weeks ago, I posted a graph of the cumulative investment of NIGMS Recovery Act funds as a function of the award start date. Below is an updated version. This graph differs from my previous one in two ways. First, it is up to date as of yesterday. Second, it includes commitments for the second year of awarded 2-year R01 grants. As it shows, we are close to allocating half of our $505 million of Recovery Act funds. We are making more awards every day, with the Challenge grants, GO grants, and faculty start-up (P30) grants to be awarded soon. The awards made to date can be broken down into seven major categories. This graph shows the amount and total number of awards (blue type above each bar) in each category. The gray-shaded area over the R01 category reflects second-year commitments. To put these figures in context, NIGMS currently supports approximately 3,600 R01 grants; 50 AREA (R15) grants; 250 Minority Biomedical Research Support (MBRS) S06, SC1, SC2, SC3, and R25 grants; 50 Minority Access to Research Careers (MARC) T34 grants; and 300 institutional research training T32 grants. We will continue to update you on our Recovery Act activities as we move from one fiscal year to the next at the end of this month. Yesterday, President Obama announced the 2009 recipients of the National Medal of Science and the National Medal of Technology and Innovation . The nine winners of the National Medal of Science include NIH Director Francis Collins and long-time NIGMS grantee JoAnne Stubbe, a biochemist at MIT. I am delighted that the President recognized these outstanding scientists and innovators for their contributions. You can access this and other relevant information from our PSI:Biology Web site. Please continue to direct any additional questions to me by e-mail or phone (301-594-0828). Over the years, we have learned that drugs act in very complex ways and cause a combination of wanted and unwanted effects, many—if not most—of which are still poorly understood. Attaining a deeper knowledge of how drugs act in the body and their connections to therapeutic and toxicological outcomes now requires a systems-level approach. At this time, NIGMS has a substantial grant investment in pharmacology and in systems biology, but we have not seen a great deal of activity integrating pharmacology with systems biology to benefit drug discovery and the understanding of drug action. With this in mind, NIGMS hosted the first Quantitative and Systems Pharmacology Workshop last September. We brought together researchers from systems biology, pharmacology and pharmacokinetic/pharmacodynamic modeling to figure out how these fields can come together to advance drug design and discovery. The group addressed the topic from the standpoint of both horizontal integration (various networks in various cell systems) and vertical integration (connections between pathways at different levels of organization, tissues, organs, etc.). You can read the workshop report for a summary of the discussions. An important outcome from the meeting was the feedback we got from participants about how far apart their disciplines presently are yet how much they have in common. The participants encouraged us to create more opportunities for them to interact and help bridge their disciplines. To help promote and facilitate these interactions, we are now planning our second Quantitative and Systems Pharmacology meeting for fall 2010. We want your input to help shape the program. What do you think are the cutting-edge topics? What are the biggest challenges? What advances are needed to develop a systems approach to therapeutics? You can comment here, or send an e-mail to me or any of the other meeting organizers. They include Sarah Dunsmore, Richard Okita and Peter Lyster from NIGMS and Grace Peng from the National Institute of Biomedical Imaging and Bioengineering. Five years ago this summer, MIDAS, the Models of Infectious Disease Agent Study, was born. When we began, we knew the effort to develop computational models of disease spread would play a role in preparing for new outbreaks—we just didn’t think it’d be so immediate. First with H5N1 fears and now with the H1N1 pandemic, our researchers have provided computational models to help decisionmakers from all levels of the government plan ways to control flu. Can you contain a pandemic locally? What’s the best way to slow the spread of flu while we develop a vaccine? What’s the impact of non-pharmaceutical interventions? Should we distribute antivirals before an outbreak? As we head into the next five years, we are adding two new centers and three research groups that are pretty exciting. They bring expertise in such areas as MRSA modeling, high-performance computing, statistics, social behavior and visualization tools for non-experts. We’re also going to put a lot more effort into understanding the ecology and evolution of disease, the impact of co-infections, and antibiotic and antiviral resistance. The two new centers have an additional charge in education and outreach, particularly with public health officials from around the world. I am especially looking forward to this, since there’s such a great need for people with backgrounds in infectious disease epidemiology to also be able to do analytical and computational work. The thoughtful, careful studies we do through MIDAS require a diverse group of people to communicate with each other every day. One thing I love about the way MIDAS has matured over the years is that we’ve built a level of trust and collaboration. Our researchers freely share data, ideas, and analytical and computational tools . As we’ve learned, health policy questions emerge and develop almost instantly as new issues arise. Our challenge will continue to be modeling in this real-time context. Got a Progress Report Due on October 15? NIH recently announced policy changes for progress reports (aka PHS 2590 and noncompeting continuation). These will take effect on October 1, and corresponding changes to the eSNAP Commons Module will follow on October 9. The biggest change for most NIGMS grantees is the replacement of the Senior/Key Personnel Report with an All Personnel Report (Form page 7) that collects information on all personnel who participate in the project for at least one person month. The All Personnel Report also implements a new NIH requirement that all individuals with a postdoctoral role with one person month or more of measurable effort must have an eRA Commons user ID. Other progress report changes address the use of human embryonic stem cells, revisions related to the NIH Enhancing Peer Review initiative, and data required for institutional training awards that support graduate students. Revised instructions and forms are available at http://grants.nih.gov/grants/forms.htm. Inquires about preparing a specific progress report should be directed to your program official and/or grants management specialist.